The popular Rockets 2013 returns to the Hill Country on May 2–5, 2013, as students from 30 Texas high schools gather near Willow City to send up 60 rockets they built as part of Fredericksburg’s SystemsGo science program. The public is again invited to visit the pre-launch prep area at the Willow City Fire House, and the actual launch site at Stewart’s Hillview Ranch, located north of Fredericksburg off the Willow City Loop. The student teams design and build 8-foot tall models that will go up from one of six launch towers. First-year students attempt to send a one-pound payload one mile high. Second-generation projects send rockets past the speed of sound. Plans call for a rocket to launch every 30 minutes between 8:30 a.m. and 5:30 p.m. on Thursday, Friday, Saturday, and Sunday. In between launches, there will be activities, demonstrations, and tours for families. Food and restroom facilities will be available. Admission is free. Organizers remind the public that the area should be considered an experimental testing range. Schedule may vary, mobility will be limited, access will be controlled, and visitors need to be aware that this is the first flight of all rockets. Direction signs will be posted. Maps to the site, launch schedule, and complete listings of activities are online at www.systemsgo.org. For online map searches and gps: N 30 degrees 24.470; W 98 degrees 40.91. 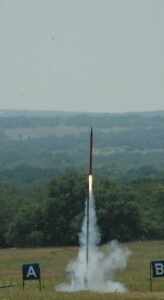 The SystemsGo Aeroscience program started in Fredericksburg High School in 1996 under the direction of teacher Brett Williams. Williams had students build and launch rockets as a way to develop skills and interest in science, technology, engineering, and mathematics (STEM). In 2007, he invited teachers from five schools to launch their finished rockets. Today this program has spread across the state, been featured on NBC Nightly News, is endorsed by NASA and certified by The Space Foundation.